These green spheres are totally opaque, flash a deep green and blue fire and have a perfect mirror quality polish. 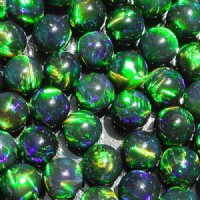 These opals look big once encased and make a great focal point. You will not be disappointed!